You probably know of Chang and Eng Bunker. 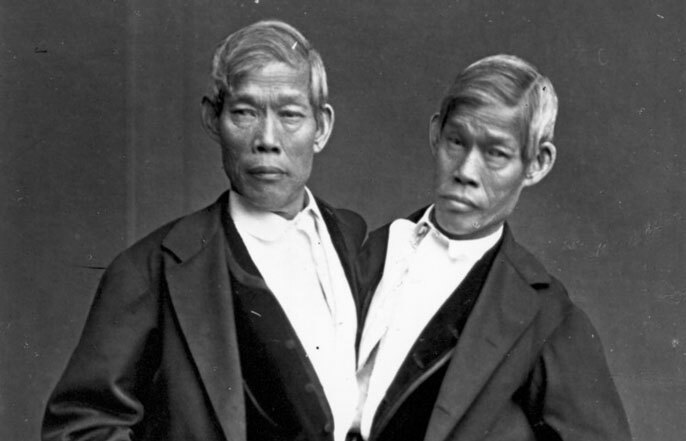 They were the original Siamese twins, conjoined brothers taken from Siam (Thailand today) in 1829 and displayed as freaks in a stodgy, provincial America desperate for novel entertainment. What you probably don’t know about them: They were savvy, hard-nosed businessmen; they weren’t afraid of getting in a fist fight; they were ethnic Chinese; they married white sisters and fathered 21 children; they settled in North Carolina and owned many slaves; they couldn’t stand P.T. Barnum. Those are just a few of the many revelations in “Inseparable: The Original Siamese Twins and Their Rendezvous with American History” (Liveright, 2018) by Yunte Huang, a UC Santa Barbara professor of English. But they also just scratch the surface of the extraordinary lives of Chang and Eng Bunker, the strangest of men in a strange land. Huang, who wrote the acclaimed “Charlie Chan: The Untold Story of the Honorable Detective and His Rendezvous with American History” (W.W. Norton & Co.), weaves a rich, sensitive tale that explores not just the twins’ lives, but their path through a divided country of rough edges and an appetite for the grotesque. Indeed, 19th-century America’s fascination with freaks and the “humbuggery” of carnival barkers like Barnum proved to be Chang and Eng’s ticket to fame and prosperity, especially in the Antebellum South. After gaining their independence in the early 1830s the Bunkers began touring. In their 10 years on the road they made a small fortune and settled first in Wilkesboro, N.C., before moving permanently to Mount Airy, N.C., where they built a farm and acquired a number of slaves. The rural, secluded area suited the twins, who were happy to enjoy some privacy after decades of being on exhibition. “That was their purpose: stay away from the limelight, to settle in the South in a very remote area — as remote as you can be,” Huang said. By the time the Civil War came around the twins had two houses, where they alternated three days at a time with their spouse, and lived as “honorary whites.” But the war and the loss of their slaves took a financial toll on them — so much so that they agreed to tour England with Barnum. Chang died in Mount Airy in 1874; Eng followed him three hours later. Today they have 1,500 living descendants, many of whom are still in the Bunker homeland. But it was someone who came after the twins that also fascinates Huang. The actor Andy Griffith was born in Mount Airy 52 years after the twins died. In 1960 “The Andy Griffith Show” aired on television, set in the fictional town of Mayberry, N.C., the sort of rural utopia prized in the mythology of America. Overwhelmingly white, slow and genial, Mayberry came to represent the United States of the good ol’ days when heterogeneity and good order dominated the landscape.